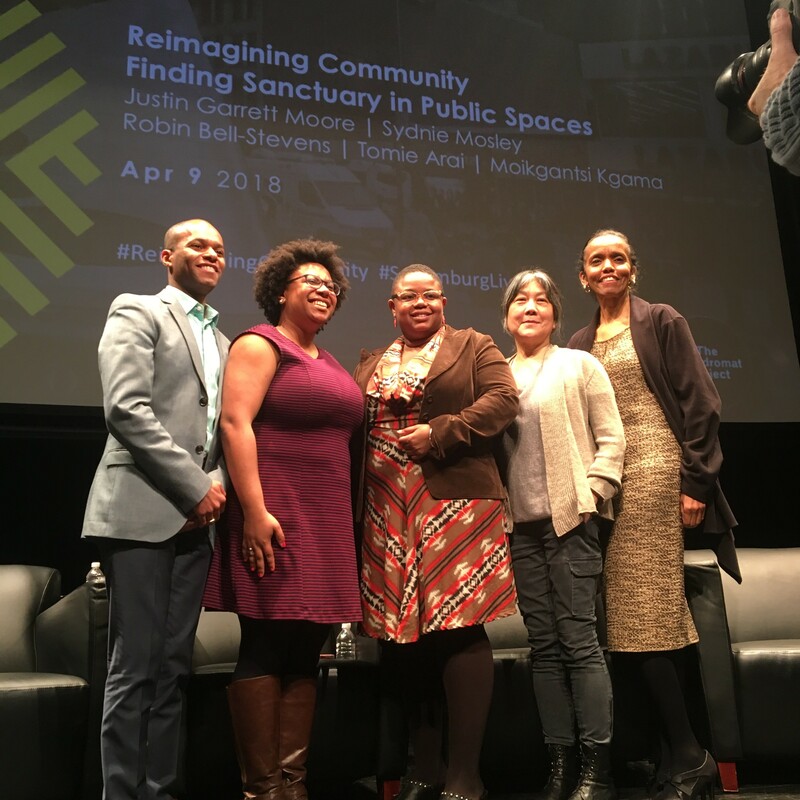 In partnership with Schomburg Center of Research in Black Culture, The Laundromat Project held the public discussion “Reimagining Community: Finding Sanctuary in Public Spaces” on Monday, April 9, 2018. With 2012 Create Change Fellow Tomie Arai (public artist and co-founder of Chinatown Art Brigade) and 2013 Create Change Fellow Sydnie Mosley (Harlem resident and founder of Sydnie L. Mosley Dances), we discussed how artists and the arts can create and support places of refuge, especially in the current moment. The conversation was moderated by Justin Garrett Moore (AICP, Executive Director of New York City Public Design Commission) and also included panelists Robin Bell-Stevens (Director of Jazzmobile) and Moikgantsi Kgama (Founder of ImageNation Cinema Foundation). The five featured panelists shared from their experiences what we can do to keep a place in our communities with the many changes that have been happening due to gentrification in the context of public spaces like parks, sidewalks, and public-facing walls. They also spoke to how public spaces offer narratives produced by residents and reflect a community’s values and norms, and how gentrification often disrupts those narratives and blurs the line between development and erasure.